Introducing our new Pocket Bum Bag in Saddle. 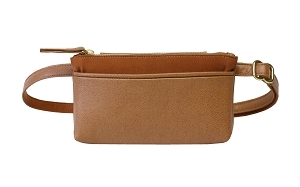 We're so excited to bring you our best-selling bum bag in two new colors for Fall. If we had to recommend one bag for someone who's new to our line and wanted to dip their toes in the proverbial HFS pool, we'd definitely choose this bag (also comes in Black, and now Olive!). Why do we love this bag so much? Well, for starters it's as chic as it is utilitarian and goes with nearly everything... but what we really love about it is that the front pocket (lined with super soft, ultra suede) acts like a personal cabana for your phone, keeping it nice and cushioned when you don't need it, but close enough for easy access when you do.